Bestselling spiritual author of The Soul Searcher’s Handbook, Emma Mildon—the “goddess-messenger-girlfriend who may just lead you to your inner guru” (Katie Silcox, New York Times bestselling author)—provides a fascinating, fun, and inspiring exploration of female divinity throughout history, myth, and religion to help women understand, embody, and celebrate their inner goddess. Evolution of Goddess is a practical introduction to the goddess realm, digging up the histories of long-forgotten myths of goddesses of love, war, death, the sun, the moon, and more. With this clear-eyed and spirited book, you can finally become familiarized with goddesses from a wide range of cultures throughout history, including the mermaids of the Atlantic, the empresses of ancient Egypt, the wise women of the Middle Ages, right up to the modern-day goddesses who walk amongst us today as humble light workers, educating and inspiring. Through a goddess assessment, you’ll uncover your own goddess archetype and be given rituals, meditations, and exercises to tap and embolden your own feminine superpowers. Imbue your life with healing, invigorating goddess energy, and discover ways to harness your new empowerment to improve the world. Now is the time to reconnect with the strength and holistic spirituality of our ancestors—to trace the evolution of the Goddess. "It’s time to get spiritual and celebrate your inner goddess. Evolution of Goddess is filled with the histories of the goddesses through the ages that you need to know. Plus, you’ll learn how to tap into your own feminine superpowers." "I'm so excited for all the women this book will be serving as it makes its way into the world." 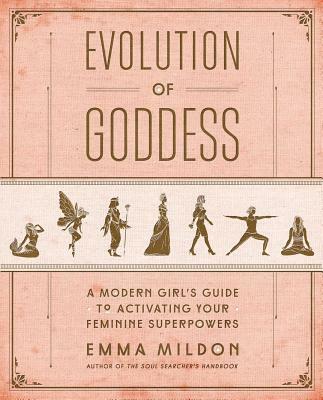 "Evolution of Goddess is a modern-day guide to the feminine. A must read for spiritual seekers wanting to dive into the rising feminine without having to read twenty different books! It is a practical guide of the Goddess over time and the best bit: presented in a way that is easy to understand and a pure joy to read." "With this book, Emma Mildon is giving a voice to the ancient herstories of our evolution, stories that have been written out of history, and with devastating effects—whether it's our failing healthcare systems, countries in continuous states of war, the repression of women everywhere, and the ravages of the capitalist system on our environment. This book is a call to arms for every woman to reclaim the Goddess in her—and in doing so help to bring about a long overdue reawakening of the Divinely Feminine principal." "The words in Evolution of the Goddess will speak directly to your soul. The connection I felt to the content and sentiment was magical; every woman on the planet has to read this book." "Emma is on a mission to guide us all to happiness, health and unlimited joy through spiritual understanding and self-awareness. I love this woman and this book. Her message cuts through the clutter and speaks to the soul. Simply transformational." "A non-cheesey look at femininity with an empowering and unapologetic take on all things goddess. A must read for every human wanting to see conscious change in the world." "A book for anyone with a burning desire to reclaim their goddess birthright. Emma Mildon plays an important role in helping us remember our forgotten history."